Brockley was once a small settlement on the Lewisham side of the boundary between Lewisham and Deptford, but it now stretches from Lewisham Way to Forest Hill. Brockley may mean �Broca�s clearing in the woods� or perhaps �the clearing by the brook�. The area was built up in the later 19th and early 20th centuries. 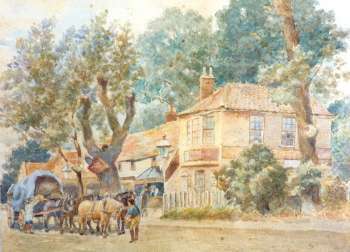 Until that time the principal buildings were Brockley Farm, Manor Farm, Brockley Hall (a large private residence), and the Brockley Jack public house, formerly a picturesque wooden building, said, with little or no evidence, to have been a haunt of highwaymen. It was owned by the Noakes family, brewers who lived at Brockley Hall. The London and Croydon Railway, which runs through Brockley, was opened in 1839, but Brockley Station was not built until 1871. Brockley Lane station (now closed) followed in 1872, and Crofton Park station in 1892. The northern part of Brockley was owned by the Tyrwhitt-Drake family who developed the estate (previously used for market gardening) from the late 1840s. They built substantial three-or four-storied houses for the professional classes. Many of these have now been divided into flats. Brockley Cemetery was opened in 1858 to serve the growing population of Deptford.